Nope. I'm not going to Honolulu (though I would love to!). 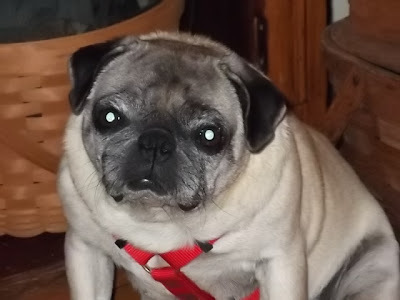 Lulu is a 6 year old owner surrender. The guy that surrendered her and her pug sister Juneau was having a bad week. 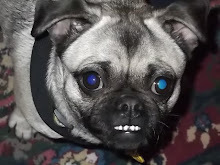 Within one week, his divorce was final, he surrendered his two pugs and his house was being foreclosed on. If it weren't for bad luck, he'd have no luck at all. Thankfully he contacted Ohio Pug Rescue and at least he knows that his girls will be well cared for and loved! 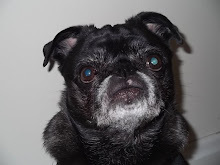 Pugs are known for their heavy breathing and gasping, but Lulu is the worst I've had. She's currently sleeping by my feet and I think it's the first time today she's not gasping ~ breathing heavy but not gasping. Poor dear. Her whole life has been turned upside down. There is some concern that she and Juneau are "bonded" and if either shows signs of distress because of the separation, they will be reunited in foster care and would only be adopted out as a pair.
. . . er, I mean rug. I've made considerable progress on my folky rabbit rug. Last night was hooking at That'll Do Farm. When I got there, Andrea was sitting on the porch chatting with knitter Pam. I guess Pam is not fond of hookers, because she immediately left . . . lol! I did not bring much cut wool and forgot my cutter, so I wasn't able to get much done. Andrea hooks with a 6 cut and does not have a wide cutterhead. She is working on her sheep and sunflower rug and I neglected to get the camera out until we went to the barns. I believe they have 24 alpaca on the farm with several more on the way. They are just too cute! LOVE that toothy grin (and wearing part of din-din)! Sunday I should have my new furbaby, a 6 year old fawn female. I'm anxious to meet her. but just wanted to stop by and say hi to everyone. and I thought I'd share a few pics with you. Last evening I did an adoption for OPR. Francine was fostering for the the first time. and she decided to adopt him. that is known as a foster failure. I can't believe another week is almost done. Summer, please don't leave me. 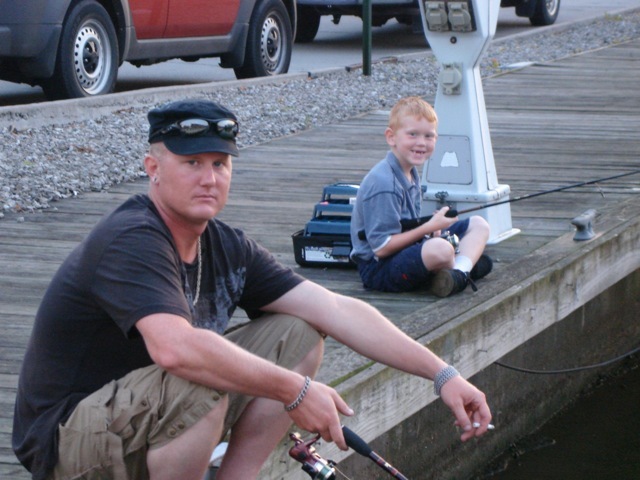 Jake and his dad (my younger son J) decided to do some fishin' Friday evening. 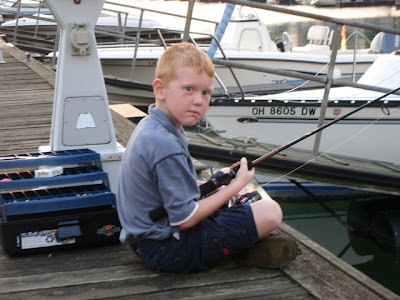 Jake was concerned that he didn't have a "lucky fishin' hat". 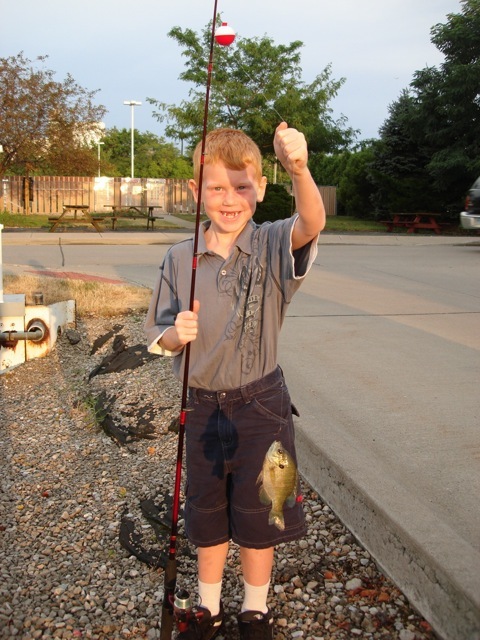 I guess he didn't need it because he caught this beauty. He was so excited!!! 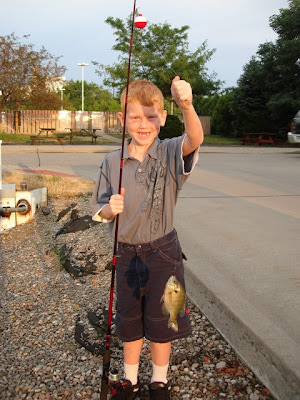 He threw him back in so it could grow up to be a really big fish. Fritz is home safe and sound from his big adventure. His goal was to fly to Petaluma, CA from Ohio and he did it. The journey home was not quite what he anticipated. After arriving in Petaluma, he went to the airport to do some maintenance in preparation for the trip home. Much to his chagrin, he discovered a leak in the fuel tank. NOT GOOD! He siphoned the gas out, took the tank out, repaired the leak, waited 24 hours for it to cure. He re-installed the tank, gassed up and it's still leaking. He called the company that manufactured the airplane kit. They overnighted a different patch material. He siphoned the gas out, took the tank out, repaired the leak, waited 24 hours for it to cure. He re-installed the tank, gassed up and once again it's leaking. He removed the tank for the third time (by then he's really good at it!) and decided the best alternative is to load the plane in the back of a U-Haul truck and head east. I am very thankful that Fritz is VERY conservative and not willing to take any chances. I called Mo's new family today and spoke with the elderly mother. She said that Mo is doing just great and is such a sweetheart. I am SO HAPPY to hear that. If all goes as planned, I will be getting a new girl in a week or so. We got some much needed rain this weekend and for that I am thankful. It is still hot and humid, but I am NOT one who is wishing for fall to get here. I will take this weather over winter any day of the week. I wouldn't mind fall if spring followed. "﻿Special thanks to all of Lauren's wonderful followers & members of Eema's Fan Club for your overwhelming support & generous donations to OPR. I kept checking on the girls' tally esp. as July 1 was approaching & it just kept shooting up! So many pug darlings will be helped. It warms my heart & makes me teary-eyed to think of how many people love Eema . . . To update you on Eema- she is still comfortable but it's a day at a time. Knowing that next year she'll be smiling in the sun in the calendar pic will be a reminder of happy times we shared. Thanks for helping & caring. Dolly"
This is a picture of Eema not long before she was adopted. Thank you, dear friends, for stopping by. I'm doing my part . . .
. . . to help stimulate the economy. Yesterday a friend and I attended an antique show. We almost didn't go because last year, it was very much like a flea market with probably half the people selling costume jewelry. Not my cup of tea. I don't know how the promoter did it, but it was a totally turned around with many quality dealers offering some great antiques at decent prices. I just love this little child's chair I came home with. I see that a small hooked rug is definitely needed for the seat. A little foot stool with a great patina also made the trip home with me. This coverlet has some major damage, but it will look good folded at the end of a bed or draped over a chair. It's the first coverlet I have with a dated corner block. It has a wonderful eagle border. I thought the bugle would be a great accent during the Christmas season. Not old, but this stand is perfect on my side porch. Overall, I thought it was a great show and I'm happy with all my purchases. Here's Mo on the couch and Loocie perched on the back. Mo may be going to her forever home on Wednesday. Yeah for Mo ~ a sad day for me. The "Christmas Story" house is located in Cleveland, Ohio, and is open to the public. As a way to raise funds for a local food bank, this Christmas tree leg lamp is being raffled. Isn't it a hoot? I hope everyone's week is off to a good start. Thanks for stopping by and please come again soon! SSSHHHHH!!! Please don't tell . . .
. . . my sweetie that I had a hot date last night and a male slept over my house. I don't want Fritz to think that it's out of sight, out of mind. My hot date happened to be my favorite 6 year old red head Jake. We had a fine dinner at the hometown Hot Dog Heaven. From there it was on to quality entertainment - Mr. Popper's Penguins. And PLEASE don't tell him that I was taking risque pictures of this male! This is Jake's "snowbaby" impersonation. After a good night's sleep, it was off to friend Belinda's pool to have some fun in the sun. Maggie the Airedale goes in and out of the pool at her leisure. I hope everyone is having a great weekend. We've had some beautiful weather here on Ohio's north coast, but it is supposed to get hot and sticky with no rain in the forecast. It's either feast or famine with precipitation here ~ and now it is famine. I am thankful that my livelihood does not depend on the weather. Last night was the monthly hooking at the library. It was a small, but very talented group of hookers. 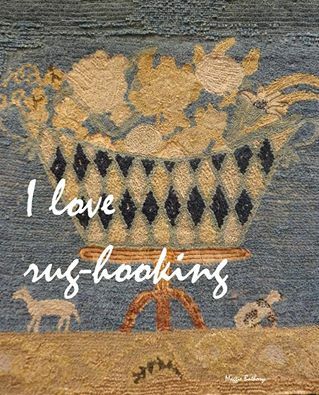 Karin hooks the most amazing rugs. Check her out on eBay. Her seller ID is primitivespirits. She bought all the wool just a few weeks ago at the Kingwood hook-in from Heavens to Betsy to hook this background. I wish I could have captured the true colors! Here's a close up of the horse . . .
. . . and the finished rug ~ already bound! Here's what she is currently working on. I love it! Arlene is working on a slightly different horse than Karin, but plans to hook a similar background. The shape of the horse is from an antique rug. I had seen Jackie, but never actually had the pleasure of meeting her before last evening. She is nearing completion on "the lion and the lamb". 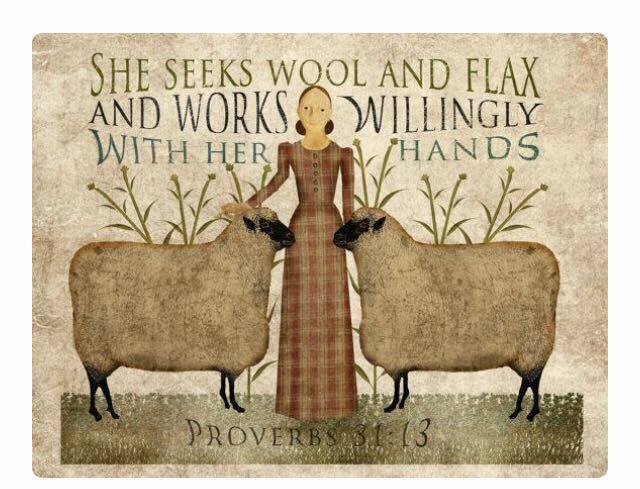 She is going to take out the wool roving she used on the lamb and replace it with yarn, I believe.. I hadn't seen Donna in a very long time. She usually does not come to the evening get togethers. It was good to see her! Aren't these houses too cute? I absolutely love the blue and browns she used in this little rug. She was spending her time binding it. This is the rug I started working on last evening. 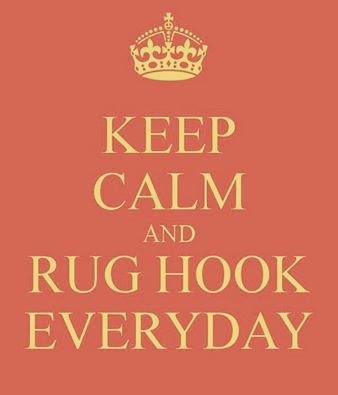 It should be an "easy hook". We'll see. I'm undecided if I like the wool I am using to hook the wascally wabbit. Thank you so much for stopping by and I hope you will come again soon!